How Long Can Cyril Delay The Inevitable? 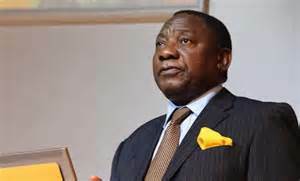 Just when he was starting to get nice media coverage for stabilizing parliament and receiving the victims of the Lagos building collapse, Cyril Ramaphosa began to feel the heat for not confirming that Jacob Zuma resigned. This shouldn’t be a surprise. He cannot redeem parliament or democracy without first admitting that Former President Zuma was the cause of its death and cannot be resurrected together with it. No matter how much substance there is to the media’s none-too-subtle whispers about Ramaphosa’s messiahship, not even he has the power to uphold such a fundamental contradiction. Former President Zuma is our albatross. If Cyril is under pressure in Parly, it’s because he’s trying to do the impossible and delay the inevitable. That’s what the current state of affairs really boils down to. The media can’t say it. Politicians can’t say it. We can see it anyway. It’s as plain as day. Just about everyone who doesn’t benefit illicitly from his presidency wants Zuma gone, but they either cannot say it out loud or don’t want to get their hands dirty getting rid of him. Notice that: they can’t say it out loud because Zuma has fractured democracy that much, and they don’t want to get their hands dirty doing it because nothing involving Jacob Zuma could leave anyone’s hands clean. Zuma cannot step down because he’s already taken the office so low that he has nowhere to step down to. For these reason, he has been resigned by public fiat. There really was no other way he could be rid of. People have been saying that Parliament is a circus. Cyril Ramaphosa went in to save that situation. But without admitting that Jacob Zuma has resigned, all he will really achieve is upgrading Parliament from being a circus to being a masquerade. Everyone is tip-toeing around the elephant in the room. Until the political clap-trap is dropped for some real-life frankness, Parly isn’t going to enjoy a full restoration of her stature.